The Noahide Nazarene Way: Did Master Y'shua Teach Hell Fire and Eternal damnation? ... As for the existence of hell as per the bible, wouldn't the "lake of fire" where those cast out on judgment day qualify as hell? Just a thought. As the Roman Catholic Church was establishing the official doctrines of the Church they included the teaching of Hell as a place of eternal, fiery torment (which is not to say it is true or false, only that it began there). Much of the imagery of Hell is identical with the Pagan underworld known as Hades. That such a place of eternal torment exists is today a most common belief among Christians still. Muslims also accept this belief. Some Hindus have a similar view except that Hell is of temporary duration. The Christian belief is that God does not torture people in Hell and does not want anyone to go that dreadful place. Hell was created for the fallen angels (Gen. 6:1-6). Humans go to Hell, it is taught, because they fail to make the decision necessary to achieve salvation, that being they refuse to accept the death, burial and resurrection of Jesus as taught by the Church. This is the standard answer. Hell is not something God "does to us," it is something we do to ourselves. But, what does the Bible actually teach about this? The Greek word "Hades" itself is in our biblical text 11 times. 10 of those times it is translated as "hell" and once as "grave" in the King James Version. This doesn't sound very Christian does it? Word Origin: Greek, Verb from Tartaros (the deepest abyss of Hell) the name of the subterranean region, doleful and dark, regarded by the ancient Greeks as the abode of the wicked dead, where they suffer punishment for their evil deeds; it answers to Gehenna of the Jews to thrust down to Tartarus, to hold captive in Tartarus." By far the most common Greek word translated as "hell" is Gehenna. "And the border came down to the end of the mountain that lieth before the valley of the son of Hinnom [i.e. 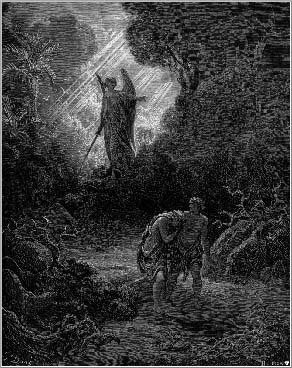 Gehenna], and which is in the valley of the giants on the north, and descended to the valley of Hinnom, to the side of Jebusi on the south, and descended to Enrogel..."
4 He sacrificed also and burnt incense in the high places, and on the hills, and under every green tree [which suggests goddess worship, Ashteroth etc.]. Matt. 5:29 And if thy right eye offend thee, pluck it out, and cast it from thee: for it is profitable for thee that one of thy members should perish, and not that thy whole body should be cast into [Gehena]. Luke 12:5 But I will forewarn you whom ye shall fear: Fear him, which after he hath killed hath power to cast into [Gehena]; yea, I say unto you, Fear him. Why? Because these were simple people and he wanted to make his teachings clearly relevant to their daily lives so they could understand. The city people often carried their trash to the dump. The flames and the stench was powerful. If one was thrown into those flames there would be no hope of survival! City people could understand the serious consequences and hence understood his analogy. Likewise, if a heavy millstone stone were tied about one's neck and he/she was cast into the sea, there would be no hope. Fisher people understood this. Besides, the idea of eternal damnation and torture by the God of Israel was unheard of! HaShem, the God of Israel, is just and merciful. An eternity of torment for even 80 years of so of sin is neither. So where did this teaching come from? Like so much of Christian dogma, the belief comes from Roman Paganism (compare http://en.wikipedia.org/wiki/Hades). 28 ...Therefore in the resurrection whose wife shall she be of the seven? for they all had her. Master Y'shua believed in the resurrection, as taught by the Pharisees and rejected by the Sadducees' doctrine. So, what do the rabbis (the Pharisees) teach? They teach the resurrection, just like Jesus did. The other word translated as hell is that found in the Tanakh (the "Old Testament"). This word is sheol. In the KJV, sheol is translated grave 31 times, hell 31 times and pit 3 times. While some Jews do believe in a place similar to purgatory -- for a time that never exceeds one year -- the word literally means grave. When a person dies they go to hell, to the grave. The Sadducees thought life ended there. Jesus, like the Pharisees, knew the soul is never destroyed. Like the Pharisees, Jesus would have believed in the resurrection of the dead to the earthly Kingdom once it is established and in reincarnation in at least some cases. These were the beliefs of most Jews of the day (other than the Sadducees who were considered odd for not believing this). This doubtless is what Jesus believed and taught. Belief in the eventual resurrection of the dead is a fundamental belief of traditional Rabbinic (and Karaite) Judaism. It was a belief that distinguished the Pharisees (intellectual ancestors of Rabbinical Judaism) from the Sadducees (that and that the rabbis embraced the Oral Torah which both the Sadducees and Jesus rejected). The Sadducees rejected the concept, because it is not explicitly mentioned in the Torah (although it is in my opinion strongly implied -- Ezekiel 37 for instance). The Pharisees found the concept implied in certain verses and taught directly in the Oral Torah such as the Babylonian Talmud. Belief in the resurrection of the dead is one of Rambam's 13 Principles of Faith. The second blessing of the Shemoneh Esrei prayer, which is recited three times daily, contains several references to resurrection. (Note: the Reform movement, which apparently rejects this belief, has rewritten the second blessing accordingly). The resurrection of the dead will occur in the messianic age, a time referred to in Hebrew as the Olam Ha-Ba, the World to Come, but that term is also used to refer to the spiritual afterlife. When the messiah comes to initiate the perfect world of peace and prosperity, the righteous dead will be brought back to life and given the opportunity to experience the perfected world that their righteousness helped to create. The wicked dead will not be resurrected according to Jewish authorities. this is one of many areas where I agree with Master Y'shua's reform movement. There are some mystical schools of thought that believe resurrection is not a one-time event, but is an ongoing process. The souls of the righteous are reborn in order to continue the ongoing process of tikkun olam, mending of the world. Some sources indicate that this reincarnation is a routine process, while others indicate that it only occurs in unusual circumstances, where the soul left unfinished business behind. Belief in reincarnation is also one way to explain the traditional Jewish belief that every Jewish soul in history was present at Sinai and agreed to the covenant with G-d. (Another explanation: that the soul exists before the body, and these unborn souls were present in some form at Sinai). Belief in reincarnation is commonly held by many Chasidic sects, as well as many other mystically-inclined Jews. See, for example Reincarnation Stories from Chasidic Tradition http://www.jewfaq.org/olamhaba.htm). For my recurring dream of my previous life as a Jew living in Bulgaria click here. Only the very righteous go directly to Gan Eden. The average person descends to a place of punishment and/or purification, generally referred to as Gehinnom (guh-hee-NOHM) (in Yiddish, Gehenna), but sometimes as She'ol or by other names. Again, we can see how thoroughly this imagery has impacted Hebrew society. By using the term Master Y'shua was drawing upon a long established tradition. According to one mystical Jewish view, every sin we commit creates an angel of destruction (a demon), and after we die we are punished by the very demons that we created. Some views see Gehinnom as one of severe punishment, a bit like the Christian Hell of fire and brimstone only of temporary duration. Other sources merely see it as a time of reflection wherein we consider the actions of our lives objectively, contemplate the harm that we have done and the opportunities we missed, and experience remorse for our actions. This view is similar to the Hall of Akashic Records that many mystics reference. The period of time in Gehinnom does not exceed 12 months, and then the soul ascends to take his place in Olam Ha-Ba. Only the utterly wicked do not ascend at the end of this period; their souls are punished for the entire 12 months. Sources differ on what happens at the end of those 12 months: some say that the wicked soul is utterly destroyed and ceases to exist while others say that the soul continues to exist in a state of consciousness of remorse, others say the wicked are sent back to earth and reincarnated so as to understand their errors. Hell, as an eternal place of torment, does not exist in my opinion. The Master of Parables merely used the well known at the time metaphor to illustrate the importance of submitting oneself fully to Hashem. Like so much of modern Christianity, the doctrine of hellfire and damnation rose from a Pagan source. 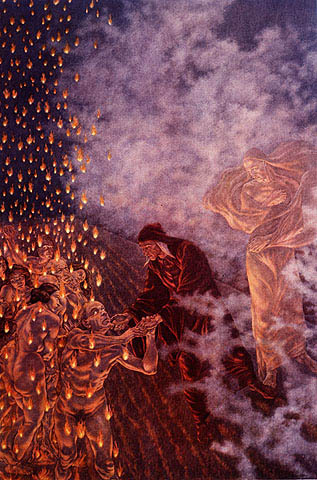 As this imagery continued we find references to the Lake of Fire in Revelation and so on. All such references are figures of speech. In simple terms, Hell is the absence of God's presence. As usual an interesting entry. I enjoyed reading it. I tend to believe more in the concept of being completely cut off from the presence of God, like being inside a black hole. Although, as you know, I do not subscribe to any kind of anthropomorphised personal diety. If you've seen the movie, "What Dreams May Come", which is loosely based on Dante's inferno, I feel like Hell is more a state of mind, or state of the soul. As depicted in the film, this is not a punishment from some angry god, but a failure of the individual. If ever there was a film which spoke to the understanding of my heart, this would be the one! Yes! I love that film too. There are many ways of illustrating a point. Master Y'shua chose two that his hearers could relate with, the town garbage dump and the sea. Were he speaking today he might reference the absence of God in one's life to be like being thrown into a trash compactor, being sentenced to life at Gitmo or indeed like falling into a Black Hole as you say. There is a moment in Steven King's The Stand (I love Steven King!) when Nick (a deaf mute hero in the story) confesses that he doesn't believe in God. Mother Abigail (an elderly black woman who plays the role of Messiah following the outbreak of a disease that wipes out almost all life on the planet), looks at him for a moment astonished, then begins to laugh! "It don't matter Nick!" he tells him. "God believes in you!" Matt 5:45 ... your Father which is in heaven: for he maketh his sun to rise on the evil and on the good, and sendeth rain on the just and on the unjust. God, the Ek Devata, is Absolute Love. Whether we believe or not. If we fail to believe in love... then it would indeed be just as well for us to be strapped naked to a rocket and fired into a Black Hole. Without love we have nothing and God is Love. Personally I believe in transmigration. I believe we enter into the material multiverse for diverse reasons but once here we become entrapped by our own greed, actions etc (ie by our karma, dharma and marga -- Click here). I further believe that the idea that God punishes us for sins is incongruent with a Being such as we Believers accept God to be. The idea that a Being who is omni everything would be concerned that puny little little me stole some gum when I was twelve or whatever makes no sense to me. If however, as I believe, the nature of this Being is Pure Love and Mercy, then I have no problem believing that we are all given free will with personal responsibly. In other words, it wasn't the gum that was the problem, it was what lays behind the act of stealing. For me to advance as a being of love and light I must purify myself from greed, deceit, lack of respect for others, placing my needs and wants before others, etc. etc. Therefore it would be in the nature of this Being we call God to gently lead us and allow us to learn from our mistakes. Having received the effects (karma) for this action (karma) of theft that violated divine principles (dharma) I grow as an individual. This process (marga) is very important for we jivas (eternal living entities). I belief this was the teaching of Master Y'shua. God is out Father who is patiently leading us ever onward. II Pet 3:9 The Lord is not slack concerning his promise, as some men count slackness; but is longsuffering to us-ward, not willing that any should perish, but that all should come to repentance. This entry was in reference to George's comment questioning my statement (at http://blog.360.yahoo.com/blog-wK0SX_k7dK5WgkkX01QOYwuwFxzFNQ--?cq=1&p=3314) that: "They [the Witnesses} are also correct that nowhere does the Bible teach the existence of hell. " It should be noted however that they do indeed believe God punishes us. Those who refuse to become Jehovah's Witnesses of even worse who have been and then leave, are utterly destroyed. This would be a terrible price to pay and is no more loving than Hell Fire and Damnation would be. The God I worship loves us and would never do such things.